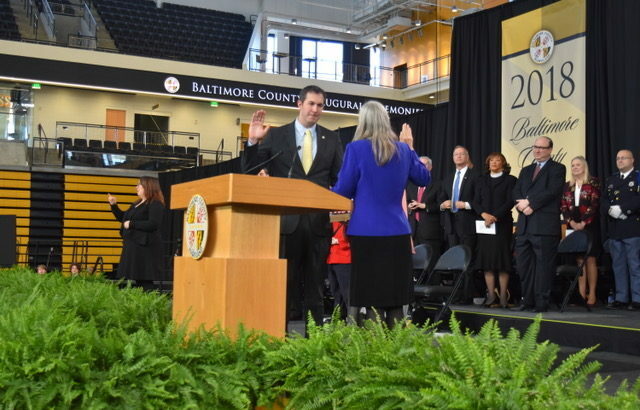 At the Baltimore County inauguration, held Dec. 3 at Towson University’s SECU Arena, Court of the Clerk Julie Ensor administered the oath of office to several elected officials in the executive, legislative and judicial branches. 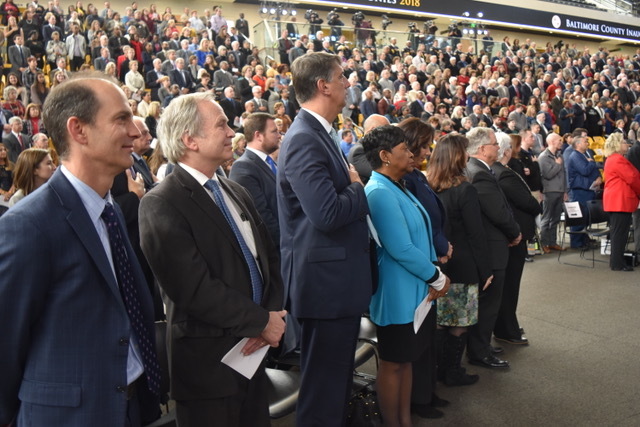 Among those sworn in were Johnny Olszewski as county executive, members of the County Council including Julian Jones, Izzy Patoka and Tom Quirk, and members of the Board of Education. In his remarks, Olszewski shared that his administration will focus on education, including expanding students’ access to community college and pre-kindergarten and rebuilding aging schools, as well as economic stability and government transparency. Shortly after his election, Olszewski appointed a transition team led by BGE CEO Calvin Butler and Rachel Monroe, president and CEO of the Harry and Jeanette Weinberg Foundation. Olszewski assigned citizens and stakeholders to participate in transition workgroups. The workgroups, which he says reflect his priorities for the next four years, are: education, job creation and economic development; public safety; health and human services; government reform and innovation; sustainability, transportation and infrastructure; diversity, inclusion and quality of life. The transition workgroups are meeting through December and January, and are to post their meeting agenda, minutes and other documents online. Only one of the workgroups has posted minutes. 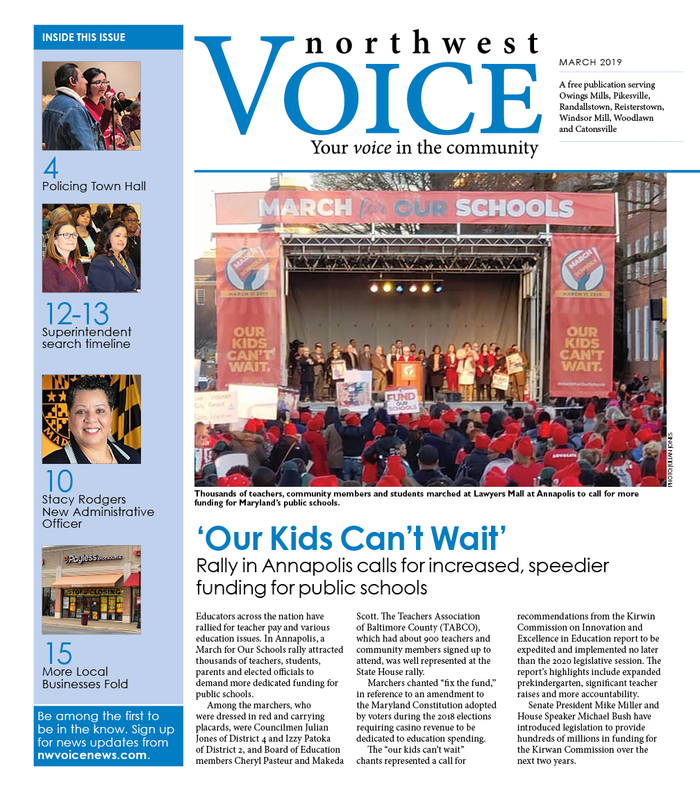 On Jan. 31 the transition team will issue a final report of recommendations to inform policy priorities. Olszewski has also appointed several agency heads—many of them are carryovers from the Kevin Kamenetz/Don Mohler administration. A national search is underway for a replacement for Police Chief Terrence Sheridan, who will retire by June. The public will be able to participate in the process through forums that will be scheduled in early 2019 and by submitting comments to policechiefsearch@baltimorecountymd.gov.